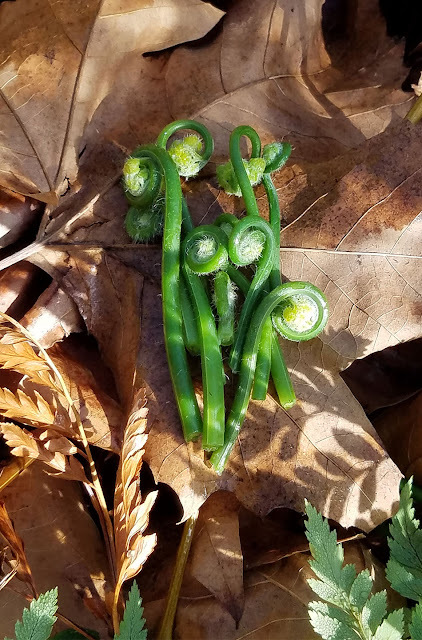 From the land of humid summer (New York) to the land of clear sun and winter rain (Cape Town), from hot-weather garden beans to cool-weather fiddleheads. Such is the switch from hemisphere to hemisphere. Bracken fern fiddleheads are rising in abundance in the damp green places in Cape Town. In the States they might be known as brake (you'll notice that word a lot if you read Faulkner's Big Woods) and eagle fern, because of the appearance of their young fronds. 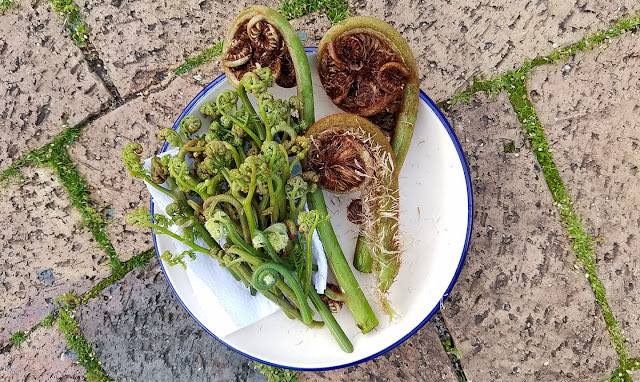 I decided to try bracken (this one is Pteridium aquilinum) for the first time, primed by my ostrich fern (Matteuccia struthiopteris) experiences, Stateside, and inspired by the annual sansai (mountain vegetable) pilgrimages of my Japanese foraging friends. 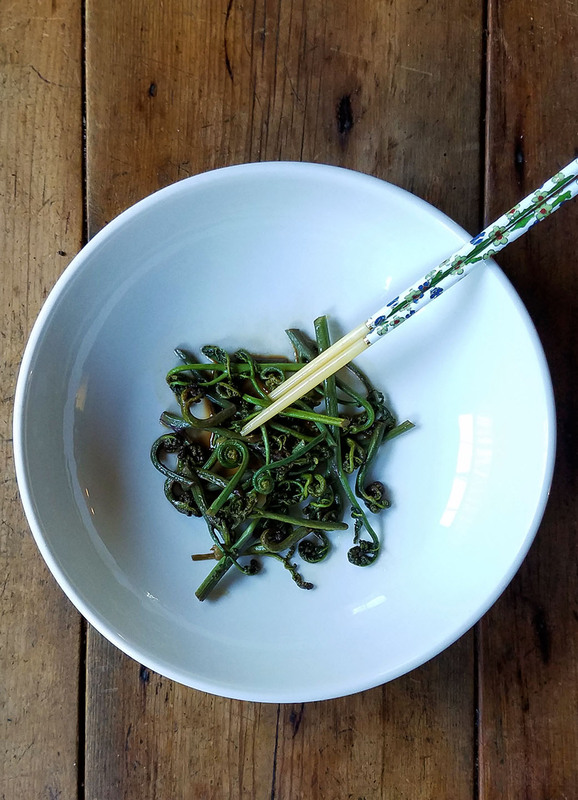 Bracken is known as warabi in Japan, and is a spring delicacy. 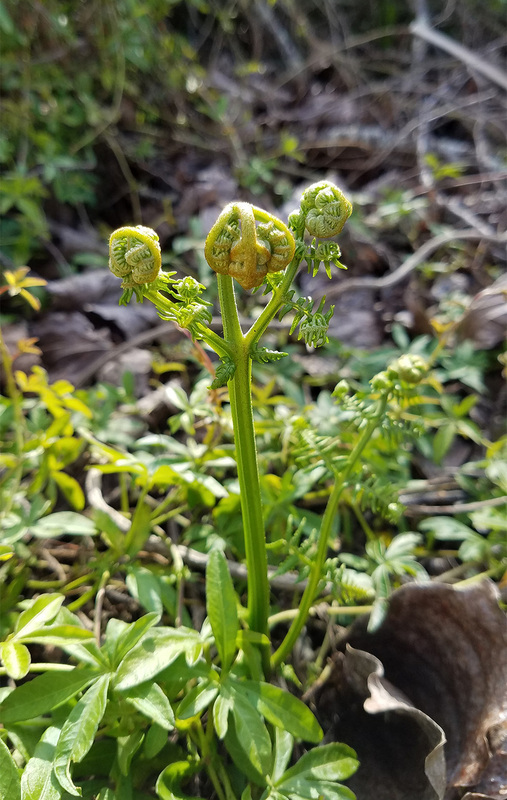 Eating bracken (and other ferns) comes with so many caveats that one could write a treatise on the subject. One thing to bear in mind is that these ancient plants absorb heavy metals and are good phytoremediators (they can clean the soil). So consider their environment before collecting any. 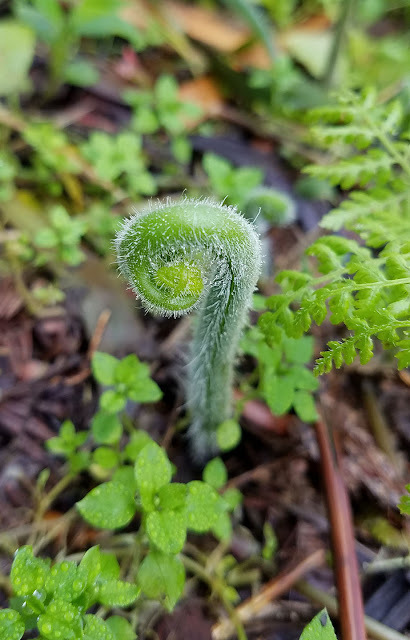 Above, bracken to the left, massive tree fern fiddleheads to the right (they are invasive locally, and I am still thinking and reading about them). The other consideration is that bracken ferns are known to contain carcinogens (perspective-reminder: alcohol is carcinogenic). Their spores are carcinogenic, and it is supposed that it's not a great idea to live surrounded by them. Suffice it to say: do not dine on (any) fern fiddleheads exclusively for any length of time. Make them an occasional treat and prepare them the right way. Soak, blanch, shock, cook. The toxins are water-soluble. Please read Hank Shaw's take on it. As with many, many foods, medicines, and poisons, it's all about the dose. I picked some young un's and soaked them in two changes of water for 24 hours. Then I blanched them in salted boiling water for about 3 minutes, till tender. Then I shocked them in an icebath for an hour. When I tasted one raw (no swallowing) it was very, very bitter. That bitterness was gone by the time the marathon soaking was done. THEN, and only then, I flash-sauteed them with some soy sauce, a sprinkle of sugar and a squeeze of the wonderful limes that grow in my mother's garden. They were delicious. Hard to describe. It's fun, and they taste good. And it's once in a blue moon. My previous comment didn't post. My question was whether they still have any nutritional value left afterwards. I do not know, Anonymous. I am eating them for novelty value and a new taste experience and am not sure what effect the soaking has on nutritional benefits.